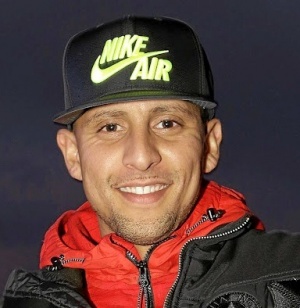 DJ Warras (born Warrick Stock on 27 November 1985) is a South African television personality, radio and club DJ. He hosted the SABC 1 flagship music show, Live AMP for over five years until his resignation in 2018. DJ Warras began his career at YFM where he hosted a graveyard show and later climbed up to daytime. He spent some time on SABC Radio's 5FM before abandoning the radio altogether in 2017. He also co-host SABC 3's The Man Cave. DJ Warras was born Warrick Stock on 27 November 1985 in Durban in the KwaZulu-Natal province of South Africa. According to a Move! magazine article, he never knew his father. DJ Warras was raised by his grandparents and mother. "I was a very smart kid. I passed matric with three As and Bs through the guidance of my grandparents, whom I stayed with. My grandfather insisted I educate myself so I that I could be able to do everything for myself. I really looked up to him and that’s why I am the person I am today. I turned out to be responsible and it’s all because of the people who raised me, and for that I am forever grateful", DJ Warras told Move! magazine in an interview. DJ Warras joined YFM in 2008 manning the late night/ early morning shows in the graveyard shift. He worked his way out to day time radio eventually hosting Prime Mode in 2011 and Undisputed in 2012. In 2014 he joined SABC Radio's 5FM and left radio all together in in late 2017. In 2012 upon Bonang Matheba's departure form that show, DJ Warras, alongside Pearl Thusi joined host Luthando Shosha. The trio had a good run until Pearl Thusi left and eventually Luthando Shosha. He was joined by Lerato Kganyago. In 2016 DJ Warras joined Lunga Shabalala, Janez Vermeiren, Siv Ngesi and Chanelle Sardinha as part of the hosting team of SABC 3's The Man Cave. DJ Warras is no stranger to controversy. He drew criticism for his rant live on radio during his YFM show, Undisputed. "I don’t care! I f*cked you! I know how you look naked. So you better show me respect. Ngik ‘dlile!" he said live on air, this was after he reportedly reacted with excitement at seeing her ex but the ex in question gave him a cold should. A listener reported DJ Warras and his 5FM Fifth Element co-host, Tumi Voster, to the BCCSA after he (DJ Warras) used terms such as "slutbags", "hoes" and "old stock" to refer to women. Tumi Voster was accused of not bringing her co-host (DJ Warras) to order. The YFM management instantly froze out DJ Warras after he notified them that he would not be renewing his contract with the station. "I was not fired from YFM like many people assume. I turned down the offer to renew my contract and they prematurely took me off my show before the end of my current contract. Management told me that I was not going to do more shows in the same meeting that I told them I was not going to continue working at YFM," DJ Warras said. "What really disappointed me was that they refused to let me do a goodbye show after I pleaded with them to do one. I've been working at YFM for six years now, I expected them to take me seriously. These are signs of a place that doesn't take its talent seriously. I didn't deserve that. But at least I'm an established brand now. Being cut off on Monday doesn't mean you are irrelevant on Tuesday," DJ Warras said. YFM chief executive Kanthan Pillay said: "Why should we give him another show? It is our station, not his." DJ Warras and co-host Lerato Kganyago reportedly beat the SABC to the punch when they suddenly resigned after they caught wind that they had been scheduled to be fired. While co-host Lerato Kganyago exhibited grace, DJ Warras was not so kind to the public broadcaster. "I officially resigned from the show on Tuesday because I was fired. The SABC is screwing us all. They told us our last show would be in June; they are bringing in new talent. What could I do or say? "How do you bring in talent to a show that has a sought-after DJ who speaks Zulu fluently and an award-winning show host like Lerato? Lerato resigned and I followed suit this week. I have been on the show for eight [SIC] years and it's been South Africa's most successful music show to date. "They are trying to fix something that is not broken, this will ultimately be the end of Live AMP", DJ Warras was quoted saying. One of the reasons cited for DJ Warras leaving 5FM was that he had established a security form which provides protection to celebrities and prominent figures. "We do VIP bodyguarding and security. We also work on big festivals and look after high-profile local individuals, whose names I can’t mention. I’m learning a lot from the business, as we give our guards skills and training. We started with 20 guys, and today we have a 200-strong complement of guards. If I get a really good offer, I’ll go back to radio. As far as the business, we have developed a lot of capacity – enough to service even the president", DJ Warras was quoted. DJ Warras has three children, all boys according to the Move! interview. "My sons are my life and I am happy to say they make me work hard. I’m never at home, but it is priceless when I’m with them. What makes me proud is that they understand the nature of my job and the reason I’m sometimes not with them. Being a father has taught me to be more responsible and cautious. Even though I am no longer with the mother of one of my sons, we are doing a great job in taking care of our child," DJ Warras was quoted. This page was last edited on 28 December 2018, at 04:14.